Whenever you login to your ProofHub account, the first screen you are going to see is Projects screen. By default, it is set on Assigned to me which will display all the projects which has been assigned to you. In it you can see projects in which recent activity has been done at first. Under Recently active, you will be able to see projects in which activity has been done recently. Projects will be displayed in form of tiles and you can see maximum 10 projects here. Below Recently active, there will be list of all projects that have been assigned to you and they will be segregated category wise. These categories and the projects under these categories are arranged in alphabetical order. If you hover on any project’s tile view or any other project showing in the list view, there is menu icon available by which you can access the context menu options of the project. On clicking it you will get options with which you can manage people present in the project, edit any details or delete them too. 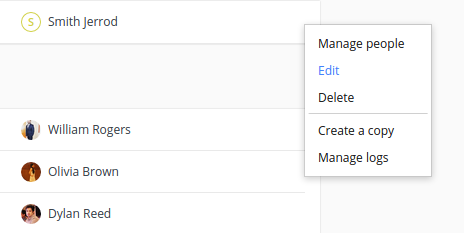 You can also reuse your projects by creating a copy of them and check the activity logs whenever required. 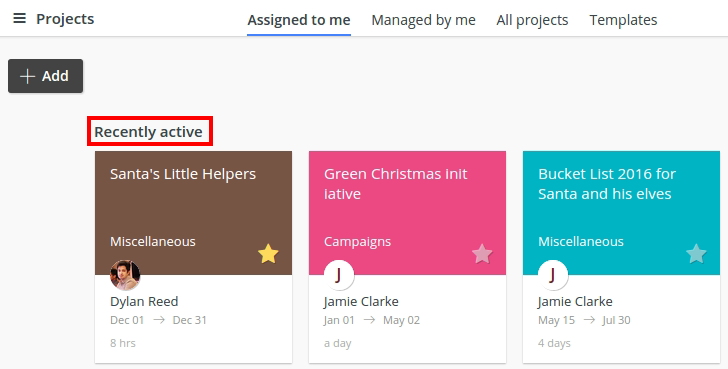 On hovering over a project’s tile you can also see all sections present within a project. You can click on any of them to directly reach that section. Click Star icon and it will be marked as starred. 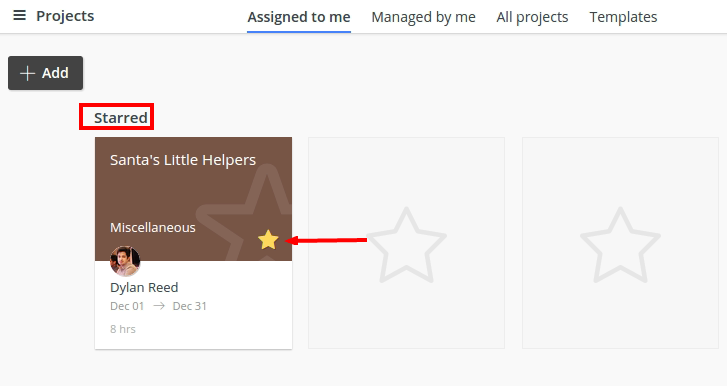 When you mark projects as starred, your starred projects will be visible on the top of your screen. And, if you don’t mark any project as starred then this starred category will not be visible. 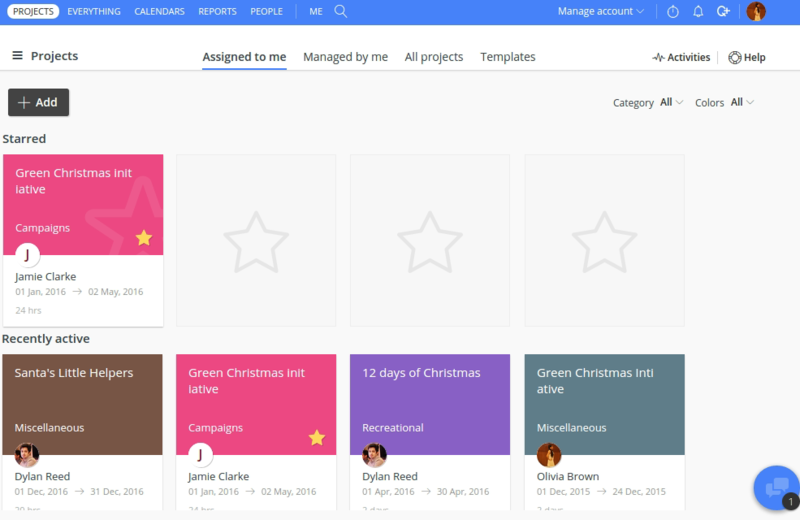 Under starred category all projects will be displayed in tile view and you can see maximum 10 projects here. However, you can mark star as many projects as you want. 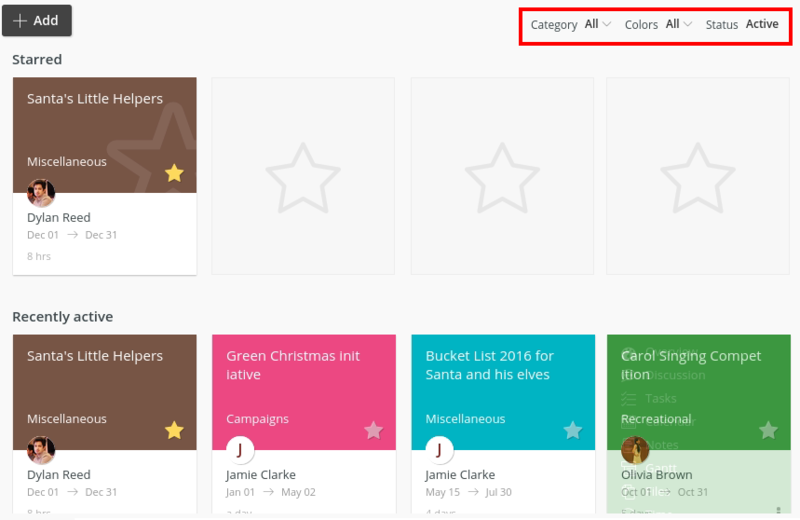 Click on Category filter and choose among the different categories that you’ve created in your account and you’ll be able to see projects present in that category. Similarly, click on Colors filter and choose any color among all and you’ll be able to see projects which have been assigned the selected colors.